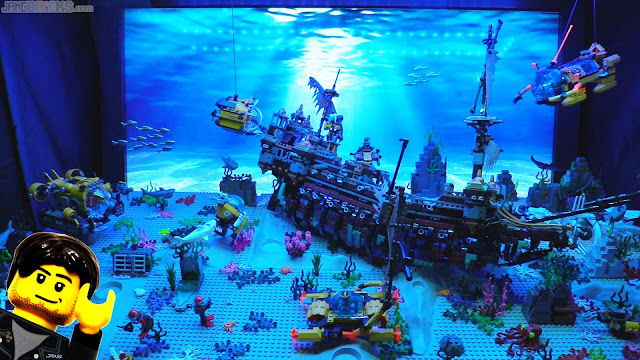 Take a peek back, if you will, at my original undersea display that I put together in 2015. It brought great personal joy to me, satisfying my love of underwater scenes that previously surfaced in my first LEGO city in the year 2000 and my zoo's aquarium in 2014. Once I dedicated a whole table to this theme, though, I just couldn't stop thinking about it. I doubled its size in 2016 and added a shipwreck in 2017. Behind the scenes, though, I was desperate for more. I've given very serious consideration (and dedicated plenty of research) to all manner of techniques to add more depth & "life" to these displays, but it wasn't until today that I realized I should just add... a display. My very first flat screen TV, now over a decade old, hasn't gotten much use in the past couple of years though it still works fine, making it a nearly perfect candidate for conversion to looping video backdrop duty. I say "nearly" because it's a fraction of an inch too tall to fit under my tables upright, thus requiring me to angle it back very slightly. It's a small price to pay, for not having to pay for a whole different TV. I've wrapped my existing backdrop drapery around the back to preserve a clean backdrop for the adjacent Nexo Knights display, and I've started using some thick weatherstripping to create baffles to eliminate reflections from my colored light strips. I've also angled the LEGO table towards us slightly to improve visibility. The video looping on the screen, meanwhile, is a quick merge of a few stock clips with some real underwater sounds, playing from an outdated Android tablet that at least has a micro HDMI port. Some further tuning is warranted, but this is a big step forward for one of my favorite LEGO things in the world, simple as it is. I'll definitely apply this technique to the other seafloor display (since it's split in two these days) in due time, but hopefully I'll be able to resist going deeply into debt adding all the TVs to all the things. Looks great, Jang! Always a pleasure to hear about what goes on behind the scenes of your LEGO city project. That is a great addition. Certainly makes that area stand out. Nice job!